Love to take a relaxing bath? Yep, us too. One of the best ways to de-stress at the end of the day is to take a nice, long soak. But if you want to treat yourself to a more relaxing bath, take a few tips from us, get organized and enjoy! Learn how to draw a perfect bath to indulge in a little at home DIY spa day! Clean the bathroom before your bath. First, remember you want to indulge all the senses when you take a relaxing bath. That means starting with a space you can relax in! Let’s face it, no one can really de-stress in a bath with piles of laundry on the floor, or a layer of dirt from your sons last football game at the bottom of the tub. This doesn’t mean you have to do a serious deep clean. But create an area for your bath that you can actually enjoy. This is the step that takes the most thinking ahead. Gather all your bath ingredients, a great big glass of spa water (or wine, :)) and a fluffy towel and robe for after your bath. A DIY bath caddy can make your bath seem like a spa day! Taking the time to set out everything you will need while in the tub will be worth it. If you love scented candles, this is great way to appeal to both your sense of smell and sight. Lower the artificial lighting in the room, and light as many candles as you can afford. Seriously, no reason to skimp here. Because the result will be a pretty magical bath! If you don’t want to use candles, you can use an aromatherapy diffuser. But really, why would you not want to use candles? The candles we use are the ‘Thyme’ brand candles. The scent is amazing and true without nasty fake perfumes. I love the “Maple” for fall, but for everyday relaxing in the bath, I have to pick their Neroli Candle. They are a bit more expensive than discount store candles but they are worth it in two ways. First, they smell amazing. Head and shoulders above anything you can buy at a discount store. Second, they last forever. So the value is there. Plus, you owe yourself some indulgences when you are caring for yourself! Oh, and at Christmas? Their Frasier Fir candle. Every time. And I have an aromatherapy diffuser that is so pretty, you don’t even know it’s there! It works wonderfully, and has light settings, settings for the amount of scent it releases, and lasts all day with out having to be refilled. Plus, it’s bamboo, a totally renewable resource! You can find my diffuser at ‘Amazon‘. Oh, and play with different aromatherapy oils. I love lavender, but I need to start mixing it up a bit. Music for Your Relaxing Bath. Do not forget this piece of the puzzle! But remember, everyone’s taste in music is different. When choosing your tunes, keep in mind you are trying to create a relaxing bath, not a “dancing in the streets” bath. I love me a little classic piano in the bath, myself. Steve is more of a lounge, downtempo electronica kind of guy. That’s right guys, a relaxing bath is for you, too. Finally, make sure your bath is full of relaxing ingredients to make you feel pampered and stress free. I love Dr. Teals lavender epsom salts to relax the muscles and provide some amazing scent. Bubble bath will help keep the heat in just a bit longer. This Philosophy Amazing Grace Scented Bubble Bath will make you feel so pampered! Try not to use anything too heavy in oils, or you will just have to finish your DIY spa day with another round of bathroom cleaning. And that’s not relaxing. And finish off by sealing in that wonderful bath with some good quality body lotion. Our whole family loves Crabtree & Evelyn Classic Rosewater Lotion. In fact, it’s in every bathroom, Christmas stocking and travel bag we all have! Be sure to get the classic rose lotion. Now crawl into your softest robe or PJ’s, and enjoy that feeling of ahhhh! A note about temperature: It is tempting to believe that hot water will make the most relaxing bath, but I always start out with warm. If you start out with water too hot, you will soon be overheated. But if you start out with warm water, you can always choose to add bursts of hot water if it gets too cool. It’s much easier to warm up your bath, than to cool down an overheated body. And who wants to feel like you spent too much time shriveling in a hot tub? 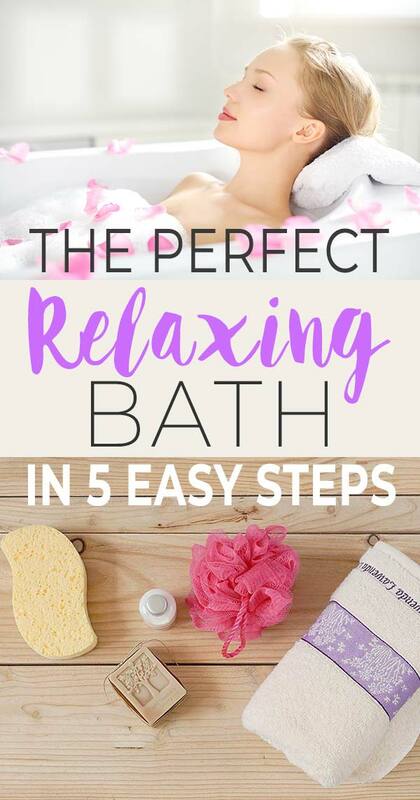 Learn to make yourself a relaxing bath to create stress relief and to provide yourself with some well deserved self care. And don’t forget, spa bath treatments aren’t supposed to be a secret. Draw one for a loved one the next time you see those familiar signs of stress and overwork! Enjoy!